Today we had a visit from Tara McGrath Education Officer with Goal. She gave a presentation about the work of Goal to 3rd, 4th, 5th and 6th Classes. The classes discussed the meaning of the word “charity”. Tara explained the work GOAL does out foreign. The classes also took part in a Global Citizenship Workshop. 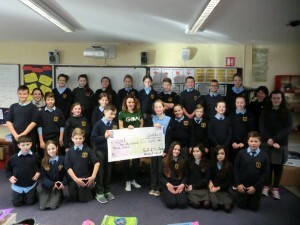 We also presented Tara with a cheque for €203 proceeds of Reindeer Run on December 21st last. Have a look in the Gallery for more photos.